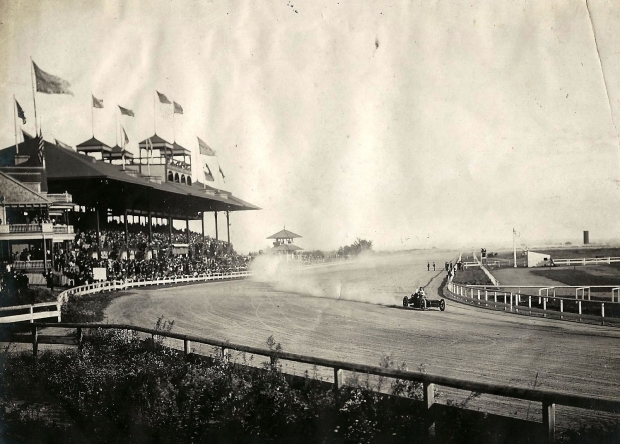 The Empire City Race Track in Yonkers, New York. 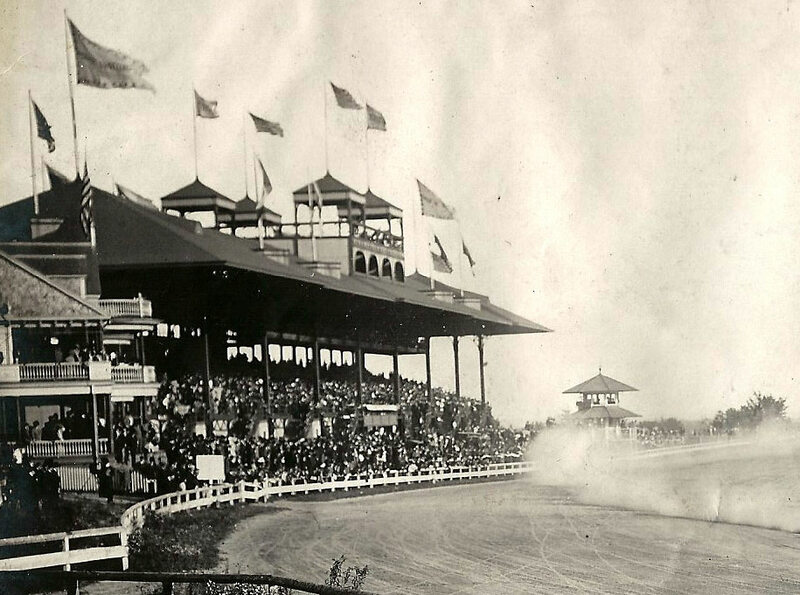 Opened in 1899 as the Empire City Trotting Club. 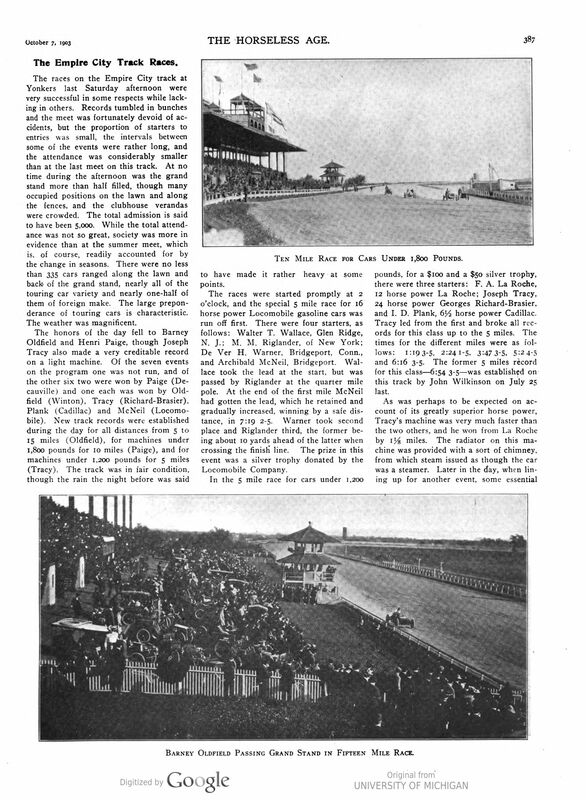 In 1950, the track became Yonkers Raceway. 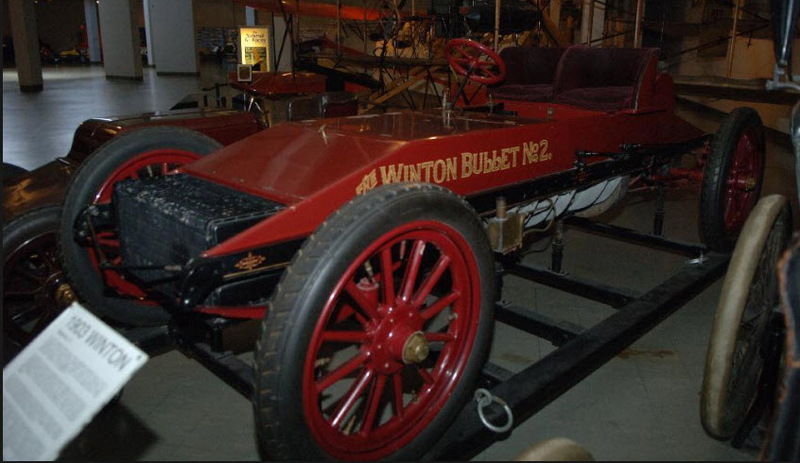 The race car was the 1903 Winton Bullet No. 2 driven by Barney Oldfield. 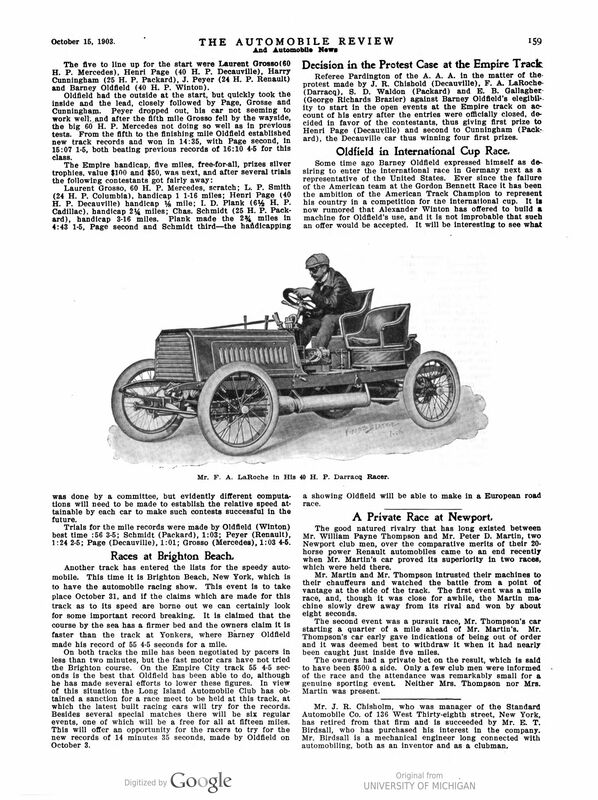 The racer was one of two Winton racers that participated in the 1903 Gordon Bennet Race in Europe. -What was the date of this photo? The photo was taken on Saturday, October 3, 1903 by photographer Edwin Levick. -What was the outcome of the race? Oldfield finished first in the race, breaking track records form the fifth mile to the finish. 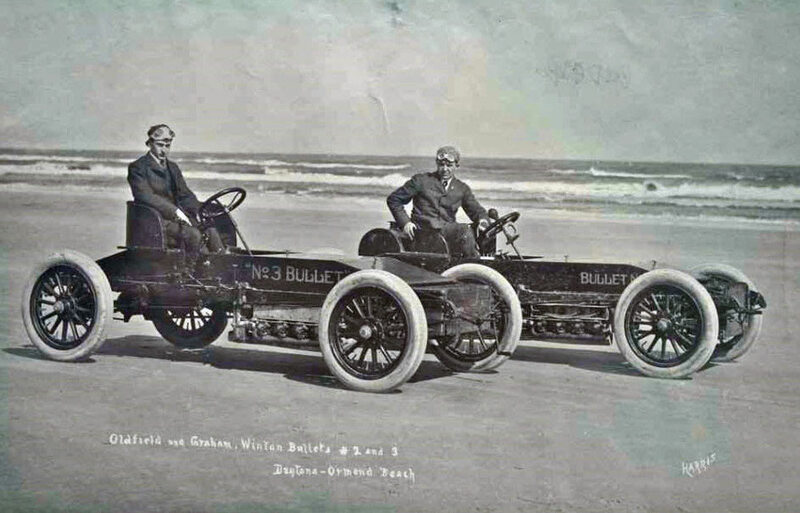 Willie K. competed with Barney Oldfield at the 1904 Ormond-Daytona Automobile Races. 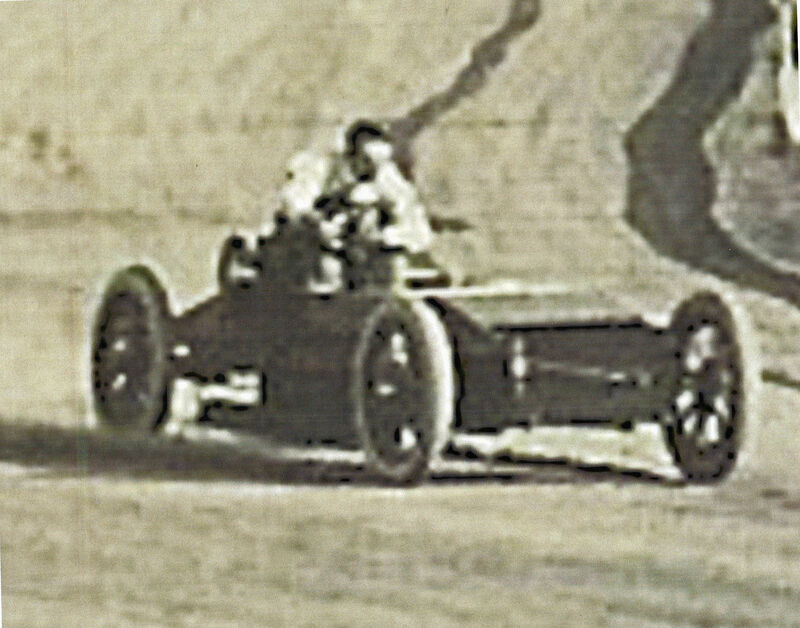 Barney Oldfield finished second in the 1914 Vanderbilt Cup Race and seventh in the 1915 Vanderbilt Cup Race. The photo was taken by Edwin Levick. 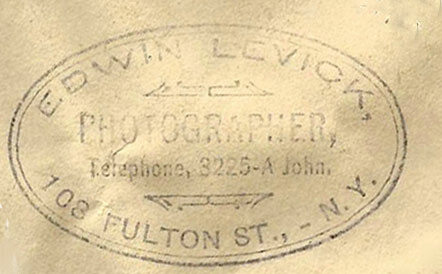 In the early 1900s, Levick was known for his photos of yachts. 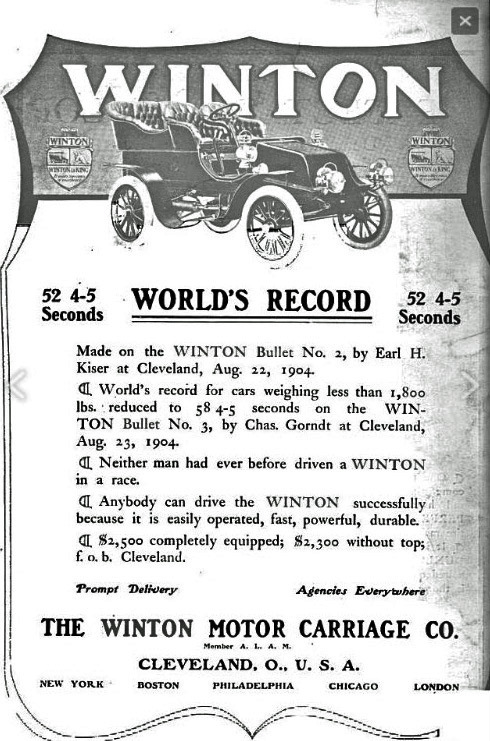 The Winton Bullet No. 2 was most recently displayed at Cleveland's Crawford Auto Aviation Collection of the Wesrtern Historical Society. Photo by Nathan Lazarnick: Barney Oldfield in Bullet No. 2. Courtesy of George Eastman Archive. Photo by Nathan Lazarnick: Barney Oldfield in Bullet No.2 at Empire City Track 1903. Courtesy of George Eastman House Archive. 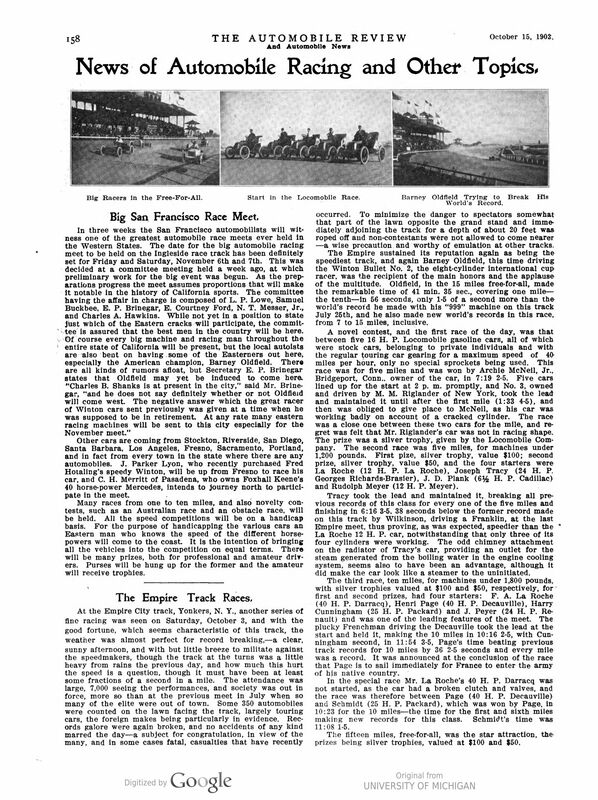 "The Empire sustained its reputation again as being the speediest track, and again Barney Oldfield, this time driving the Winto Bullet No. 2, the eight-cyclinder international cup racer, was the recipient of the main honors and the applause of the multitude." The Mystery Foto was uded in the article. Caption: Barney Oldfield Trying to Break His World's Record. 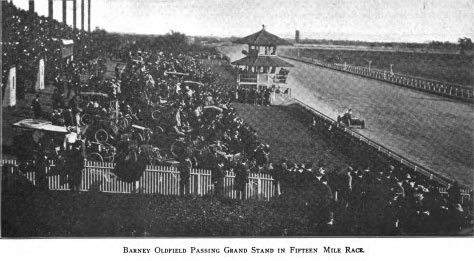 "The fifteen miles, free-for-all, was the star attraction, the prize being silver trophies, valued at $100 and $50. The five to line up foir the start were Laurent Grosso (60 H.P. Mercedes), Henri Page (40 H.P. Decauville), Harry Cunningham (25 H.P. Packard), J. Peyer (24 H.P. Renault) and Barney Oldfield (40 H.P. Winton). Oldfield had the outside at the start, but quickly took the inside and the lead, closely followed by Page, Grosse and Cunningham. Peyer dropped out,his car not seeming to work well, and after the firth mile Grosso fell by the wayside, the big 60 H.P. Mercedes not doing well as in previous tests. From the fifth to the finishing mile Oldfield established new track records and won in 14:35 with Page second in 15:07 1-5, both beating previouse records of 16:10 4-5 for this class." A photo of the Winton team posing on the beach at Daytona-Ormond which in reality were one and the same. 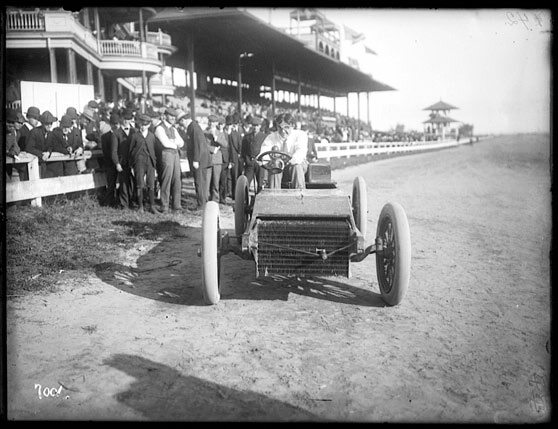 The Ormond name was used for primarily the early winter speed meets. Both the Bullet No. 2 and No. 3 were at the 1904 speed meet and Oldfield evidently was able to set a worlds record at the time for a mile. Oldfield’s No. 2 was a straight eight (the 3rd. 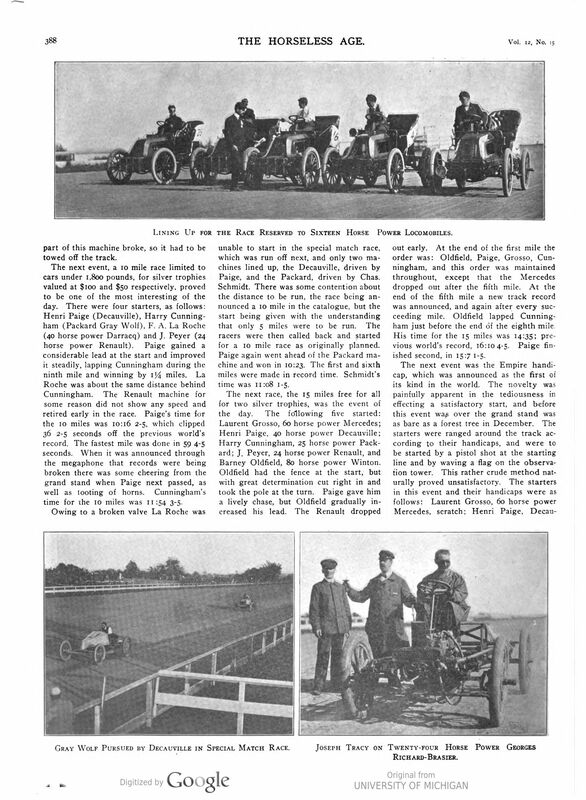 thumbnail below from the Automobile Review gives full details) and Graham’s racer was a four. 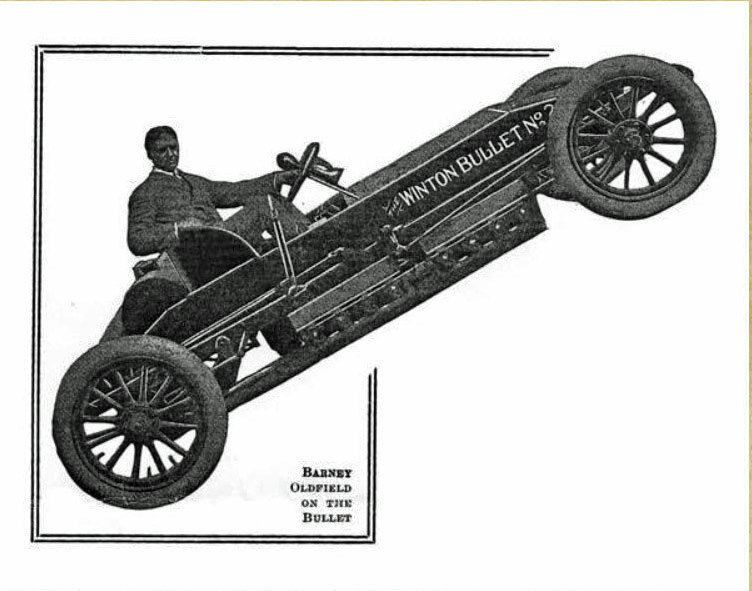 This unique image of Barney Oldfield on his Winton Motor Carriage Company's "Bullet No. 2" racer was captured in the spring of 1904 as he attempted to qualify for that year's James Gordon Bennett Cup Race. Oldfield was Alexander Winton's contract driver for about eight months, from August 1903 to April 1904. 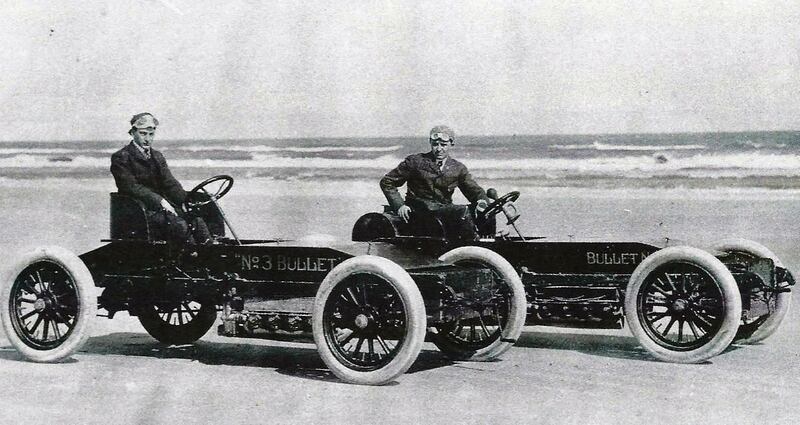 Oldfield was very successful at the wheel of the Bullet, setting the world's competition mile record at Ormond Beach in January 1904 just after busting numerous records on a whirlwind tour of the West Coast. 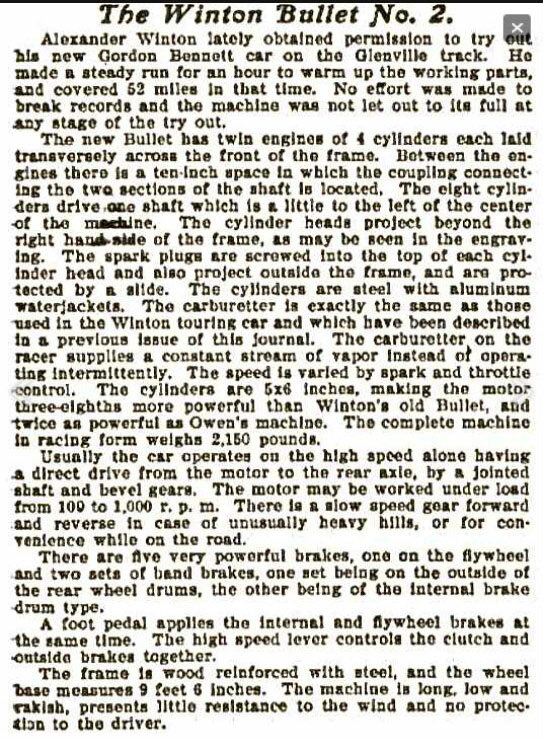 A rough-cut, Oldfield was not a good cultural fit at the staid Winton Motor Carriage Company. His barnstorming antics in the South during the winter created friction between driver and millionaire owner Winton and they parted ways after the Automobile Club of America (ACA) officiously decided they would not field a team in international contest, held in Germany that year. What runs this car? Does it have anything to do with the VCR? Is my mystery. Not even a clue on this one? This is my answer for last Friday quiz. 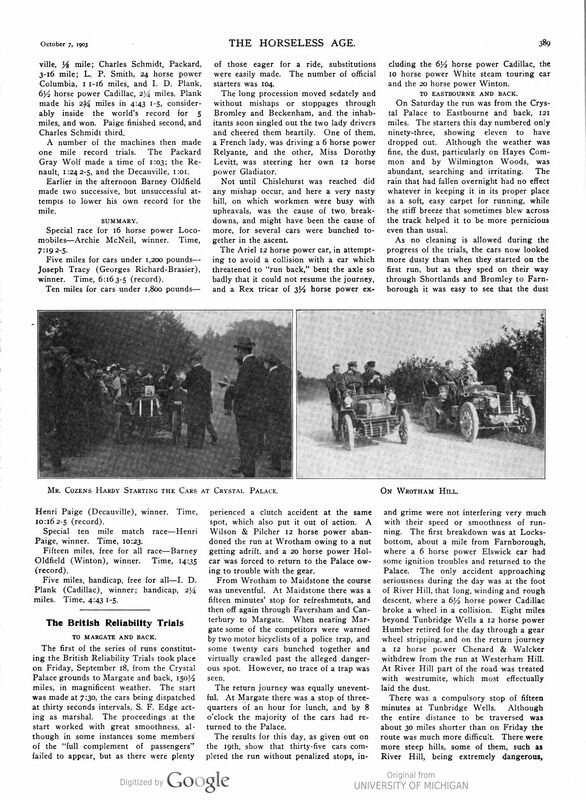 I added two additional photos by Lazarnick from the George Eastman House archive and two reports, one from The Horseless Age and the other from The Automobile Review (in which you can see your mystery photo on the first page, top right). As always thanks for the fun! 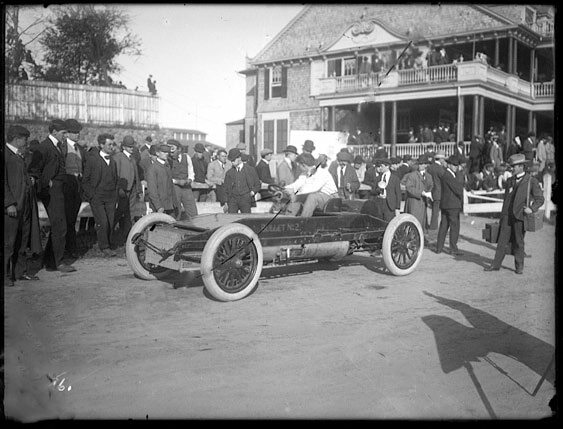 The track is the Empire City track, the date Saturday, October 3, 1903 and the car the Winton Bullet No.2 with Barney Oldfield in a nice white shirt and with his characteristic pose behind the wheel. The weather was ‘nearly perfect’ for records that day according to the report in The Horseless Age of October 7. Earlier that year, on July 25th, Oldfield had set the mile record at 55.8 secs with the Ford ‘999’. Nearly perfect wasn’t perfect enough though, as during the 15 Mile Free for All race Oldfield wasn’t able to break his previous mile record (his fastest time was 56 secs). However he broke all records from 7 to 15 Miles.